During our recent visit to India we stayed Colonel Pradeep and Dr Sridevi at Devlali and their house was located in Pratap Enclave. The enclave was named after Late Captain Pratap Singh, MVC and at the main gate of the enclave there was a board with his photo and a brief write-up about his heroism. Lieutenant Pratap Singh arrived on posting to our regiment, 75 Medium Regiment in January 1985 when we were located at Delhi. A few months prior he had lost his elder brother Late Squadron Leader Gaj Singh of the Indian Air Force in an air crash in Rajasthan. Lieutenant Pratap had come on a posting on compassionate grounds to take care of his aging parents who lived at Basai Darapur village, near Punjabi Bagh, New Delhi. At that time, his elder brother Colonel Ran Singh was serving with an Air Defence Regiment of the Indian Army. Captain Khazan Singh, father of Lieutenant Pratap was a World War II veteran. Ever smiling Lieutenant Pratap joined our regiment and in no time got amalgamated with the regiment. He was a good sportsman and a great leader and won the admiration of all the men. Despite all the problems he faced, he always looked cheerful and was cool as a cucumber at all times. Lieutenant Kaushik, Pratap and self, we became the “trouble shooting trio” of the regiment, who could be sent on any missions anywhere. As Lieutenant Kaushik was married, Pratap and I generally took on all out-station tasks – mostly going to Meerut to participate in sports competitions with the Brigade. Colonel Mahaveer Singh was our Commanding Officer (CO), who took utmost care of all of us as his sons and had a major role in developing us into good human beings and leaders of men. Lieutenant Pratap and self being bachelor boys dined in the Officers’ Mess. The mess and the bachelors’ accommodation were located in Sector 14, Gurgaon and some of the married officers also lived there. The regiment was about 10 kilometers away and we all used to travel to and fro the regiment on one vehicle. Every day at 1:30 PM we all would assemble in the Adjutant’s office for our travel back to Officers’ Mess. Captain Rahul Gowardhan (now a retired Colonel) was our Adjutant (assistant to the Commanding Officer) and once he was busy closing up for the day and he accidentally tore off an important sheet of paper assuming it to be trash. The Lieutenants were all immediately tasked to assemble all the torn pieces of paper and solve the jigsaw puzzle to retrieve the original document. After that whenever we assembled at the Adjutant’s office for our return journey, Pratap would pick up all the torn papers from the wastepaper basket and start solving the jigsaw puzzles with us until one day Captain Gowardhan asked us as to what we were doing. Pratap said “we do not know when you will tell us to recover a document, so why not utilise the time”. 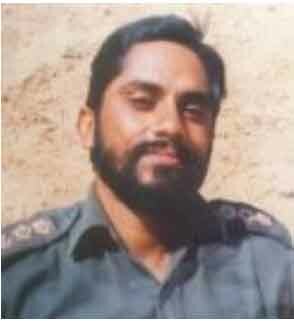 Captain Desh Raj (now a retired Colonel) was a great sportsman and appointed himself as the commander of the bachelors (he always considered himself as a youngster). He would mostly accompany us and would always guide us in our day-to-day duties and also join us in most of our adventures. Then we had Late Colonel Avinash Chandra, affectionately called by all of us as “Guruji” as he always had something to contribute about anything and everything. He would always be forthcoming to save us from all our misdeeds and also resolve many difficult situations. Every day at 1 PM, the Mess Havildar (Sergeant) would ring up the office to find out whether Pratap and I were coming to the Mess for lunch. The aim was to decide on the quantity of food to be prepared as we both were in our early twenties and would eat heavily. Hats off to Mrs Chandra, Mrs Desh Raj, Mrs Gowardhan and Mrs Kaushik for standing to our ‘gluttony’ whenever we landed at their homes, especially at mid-night. All the ladies would welcome us and would serve us excellent dinners. Major Mohan Krishnan, a war veteran, was our Second-in-Command and was a simple and jovial person. Once he called Pratap and me to his office and admonished us about our late night at the Officers’ Mess. He ordered that for dinner, one had to reach the Mess by 9 PM and the Mess had to be closed by 10 PM. After a few days we reached around 9:10 PM and the Mess Havildar expressed his inability to serve us dinner as we were late. We decided to go for the movie in the town and we landed back at the Mess at 1 AM. Now Pratap told the Mess Havildar “the Second-in-Command has only stipulated the time for closing the Mess, but he has not laid down any timing for the opening; hence now serve us breakfast as a new day has dawned”. That was the end of the Mess closing timing. We both got promoted to the rank of Captains and were appointed Observation Post (OP) Officers. Our duty in war was to direct the artillery fire to the target. The guns fire from about 10 km behind and it is the duty of the OP officer to direct the fire on to the target. In case the shells do not land on the target, a correction is ordered in terms of “Go Left/ Right” or “Add/Drop”. During our operational training with live artillery firing, Captain Pratap would very often confuse between Right and Left and many a times ended up giving the opposite corrections. Colonel Mahaveer Singh our CO came up with a solution – with a marker pen he wrote “LEFT” on the inside of his left wrist and “RIGHT” on the right wrist. He told Pratap to look at it prior to ordering a correction and the simple trick worked. At the end of the day I even advised Pratap to tattoo it on his wrists, never realising what was in store……. I liked your article on day today anecdotes of 1985-86. I joined the unit on 04 Jul 86 and recd by Maj Kaushik at Gurgaon Rly Stn and. taken to Offrs Mess on his Lambreta ( purchased from Col Mahavir, our CO). Therafter deposited in House No 856, Sectoe 14, Gurgaon, popularly known to be Bachlors’ den. Initially I met u at our passing out at IMA along with my coursemate & your country cousin Srilal SK.